I’ve been working more and more, over the last 6 months or so, with WordPress for one of my larger clients. As I’m sure you’re aware, WordPress is a blogging platform come entire website framework, which is it seems more and more companies are turning to in order to create the basis of their websites. No doubt due to the free nature of the framework, along with the sheer amount of support available. One of the great things about WordPress, is it’s customisability.. There are quite literally hundreds of thousands of themes, widgets and plugins available, which can turn the vanilla WordPress install into a fully functioning e-commerce solution for instance. However…. I digress slightly….. Back to the purpose of this post…. My client specialises in events, organisation and management, and they use WordPress sites for the Publicity, Information and Registration side of things. 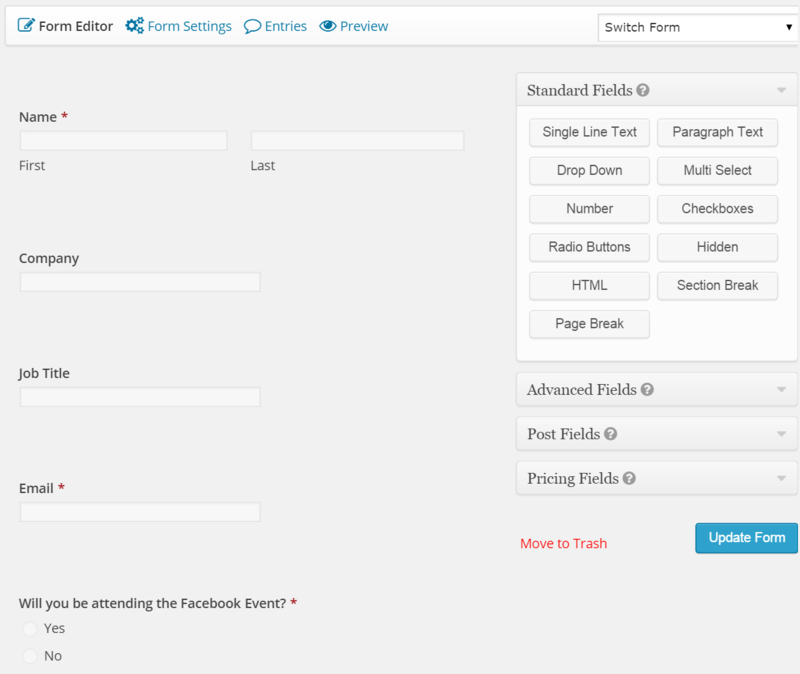 Using this plugin, my client is able to create the structure required to allow guests to register for an event. Gravity forms allows for customisation of the Confirmation messages, and will even email out once a form has been completed. Fields can be “routed” allowing only certain parts to be shown depending on the entries in other fields. They can also be pre-populated from information stored in the users’ profile, lessening the time required for guests to fill out forms. All the entries can then be exported to a csv file, and analysed in Excel. If you want to find out more, hit their website up and explore! However, Gravity Forms will only get you so far, and inevitably, you’ll reach a limit to it’s flexibility. Which is exactly where I’ve found myself on quite a few occasions lately, and as such, I’ve need to put my favourite programmers hat on, and start tinkering! The first bit of functionality my client asked for will be the theme of this first post, and I’ll then go ahead and make a further few posts detailing some of bits I’ve created, in the following few weeks. Guests were pre-registered for the site, that is, my client had been supplied each guests’ Name and Email address. However, the site was designed to be fully open, so guests shouldn’t need to login at all…. However, my client needed the Form to only accept Attendance submissions from people who had been pre-registered on the site. Of course, WordPress will allow you to lock pages so that only logged in users are able to view them…. But this wasn’t the UX my client wanted. As this wasn’t something that Gravity Forms was able to do either, I needed to come up with an alternate coded solution. Like a lot of things in the WordPress space…. GravityForms is designed to be extensible. As such, GravityForms provides a Handy API for developers like me to hook into. What I needed to do was to match the email address the guest enters in the registration for to the list of pre-registered users stored in the WordPress Users Table. My first thought was to use the gform_pre_submission_filter filter and prevent the form from being saved to the database… But this wasn’t ever going to be the best way to go about this as I wasn’t able to deliver any meaningful response back to the user…. 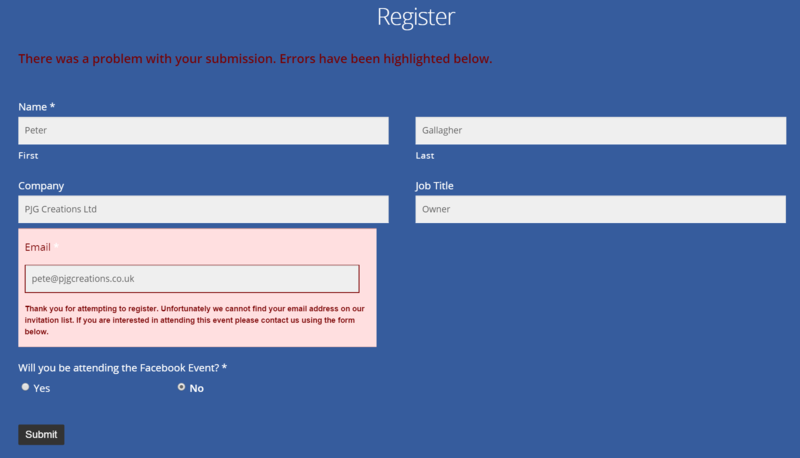 What I really needed to do was to hook into the Forms’ Validation Filter so that I could return some meaningful feedback to the guest, that their entry wasn’t valid. 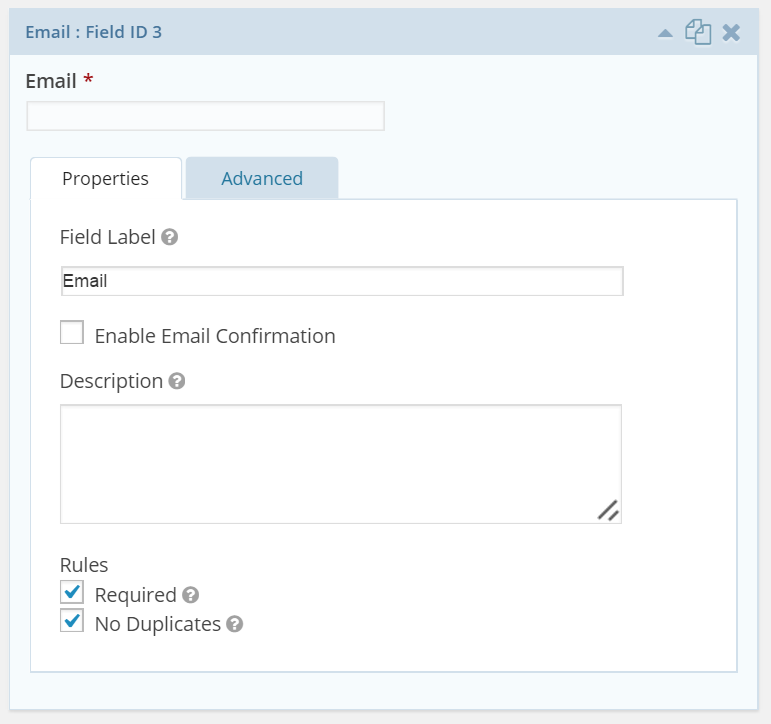 GravityForms provides a handy filter; GForm Validation allowing you to grab a form before it’s submitted, check its values, and return a validation result based upon your own logic. Where the first parameter of the add_filter function is the name of the filter to hook into, the second parameter names our custom validation function name. Handily, the documentation provided an example to prevent a specific number from being entered into a field, which obviously gave me a head start with my coding. This Filter allows us to return a validation result based upon whether or not the Users email address exists in the pre-populated WordPress Users table based on the email address the guest enters while registering. The next thing we want to do is search for users based upon the email address field. WordPress provides a handy function for this; get_user_by(); – which is described in the codex as “Get user data by field and data. The possible fields are shown below with the corresponding columns in the wp_users database table“. This function accepts a field name and a value to search for within that field, and returns either a user if the search pattern matches an entry, or nothing if no match is found. If the function finds a User, the object will be stored in the $user variable, and if no Users are found then this variable will be null. What we want to do is, if there’s a user found in the database that matches the Email Address the guest has entered, then allow the form to be submitted. However, if no User is found, then we want to fail the Validation and prevent the submission.